Asked if any additional resolutions would be approved, Aaron Noé said the decision would be up to the conference, saying he did not know whether or not Xanana Gusmão would attend. "The panel was only invited by the National Political Commission which is who convened the conference," he explained. 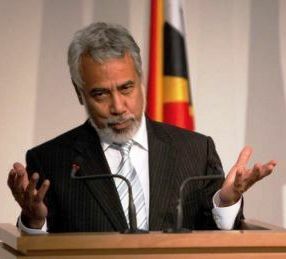 Source close to Xanana Gusmao confirmed to Lusa that the Timorese leader "does not participate" in the conference. Lusa tried unsuccessfully to contact several members of the National Political Commission (NPC) to confirm more aspects of the agenda of the meeting, that the press has not been officially informed so far, and to confirm that Xanana Gusmão, absent from the country, has several weeks, whether present or not. Xanana Gusmao plans to attend next week in the Australian city of Brisbane in a business round related to the future development of the Greater Sunrise field in the framework of the negotiations on the new maritime border treaty with Australia. The meeting was initially scheduled for the Australian city of Perth, where Xanana Gusmão was expected Sunday, but was postponed to Brisbane at the request of the oil companies involved, Lusa confirmed. It should be recalled that in the aftermath of the July 22 legislative elections - where the CNRT was the second most voted party behind Fretilin, which won only 1,135 votes - the party met at a National Conference that ran almost at the door closed. In the opening speech of the conference, Xanana Gusmão announced his resignation from the presidency, which at the end of the party's meeting ended 'suspended' until an Extraordinary Congress was held, with the Timorese leader to be 'without full powers'. At the same meeting the party approved another resolution in which it determined that it would remain in the opposition during the current legislature, going against the position defended by Xanana Gusmão. "The CNRT party decides to be in the National Parliament as an opposition, wanting to continue to contribute to the process of state building and nation building, to consolidate the democratic transition in this country," said Xanana Gusmão. The Timorese historic leader has stated that "the party will not accept proposals from anybody, nor will it invite any party to form coalitions, because it does not intend to participate in the government" and that it will not repeat what occurred in 2007, when the CNRT was the second most voted behind Fretilin but "to solve the crisis that the country lived," chose to form a parliamentary majority alliance. Following the seizure of the Seventh Government, formed by a minority coalition with the support of the Revolutionary Front of Independent East Timor (Fretilin) ​​and the Democratic Party (PD), the CNRT joined the other opposition parties [Liberation Party Popular (PLP) and Kmanek Haburas National Unit Timor Oan (KHUNTO)] in a new Alliance of Parliamentary Majority (AMP). The AMP was already offered to the President of the Republic as an alternative of governance in the case of the fall of the Government if, as happened in October, the opposition again for the second time to hit the Government's program. The executive led by Mari Alkatiri announced that he will present the second program in conjunction with a 2017 Reform Budget "by the end of the year".